What is the official definition of an (economic) depression? Although the term is often heard, the term seems to lack a well-structured definition. The term depression is often used to refer to a particularly severe period of economic weakness. Some economists use it to refer only to the portion of these periods when economic activity is declining. The more common use, however, also encompasses the time until economic activity has returned to close to normal levels. The most recent episode in the United States that is generally regarded as a depression occurred in the 1930s. However, just as the NBER does not define the term depression or identify depressions, there is no formal NBER definition or dating of the Great Depression. … a 10% contraction is often cited as the tipping point. Although there is no formal definition, most economists agree it is a prolonged slump with a 10% or more decline in real GDP. As well, other sources confirm the lack of a standardized definition, although the 10% decline in economic activity (measured via real GDP) is most commonly cited. This entry was posted in Depression and tagged Depression on November 30, 2011 by Ted Kavadas. The post examines the inability of the New York Fed, as well as the vast majority of professional forecasters in general, to predict the “Great Recession.” It also mentions the failure of forecasters to predict the decline in housing. Economic forecasters never expect to predict precisely. 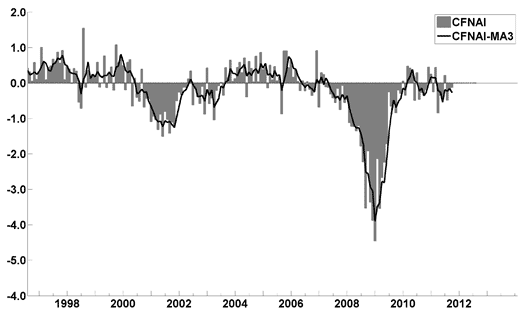 One way of measuring the accuracy of their forecasts is against previous forecast errors. When judged by forecast error performance metrics from the macroeconomic quiescent period that many economists have labeled the Great Moderation, the New York Fed research staff forecasts, as well as most private sector forecasts for real activity before the Great Recession, look unusually far off the mark. On the basis of their analysis, one could have expected that an October 2007 forecast of real GDP growth for 2008 would be within 1.3 percentage points of the actual outcome 70 percent of the time. The New York Fed staff forecast at that time was for growth of 2.6 percent in 2008. Based on the forecast of 2.6 percent and the size of forecast errors over the Great Moderation period, one would have expected that 70 percent of the time, actual growth would be within the 1.3 to 3.9 percent range. The current estimate of actual growth in 2008 is-3.3 percent, indicating that our forecast was off by 5.9 percentage points. Using a similar approach to Reifschneider and Tulip but including forecast errors for 2007, one would have expected that 70 percent of the time the unemployment rate in the fourth quarter of 2009 should have been within 0.7 percentage point of a forecast made in April 2008. The actual forecast error was 4.4 percentage points, equivalent to an unexpected increase of over 6 million in the number of unemployed workers. Under the erroneous assumption that the 70 percent projection error band was based on a normal distribution, this would have been a 6 standard deviation error, a very unlikely occurrence indeed. Economic forecasts and their accuracy is of great importance for a variety of reasons. It is because of this importance that this blog features many economic forecasts and financial market predictions. The accuracy of predictions prior to and during the “The Great Recession” serves as a reminder to how difficult financial crises, and their impacts, are to predict. The inability to predict “The Great Recession” should serve to cast uncertainty on forecasters’ ability to predict future severe economic weakness, especially since the level of complexity inherent in the overall economic environment is, according to my analyses, growing. 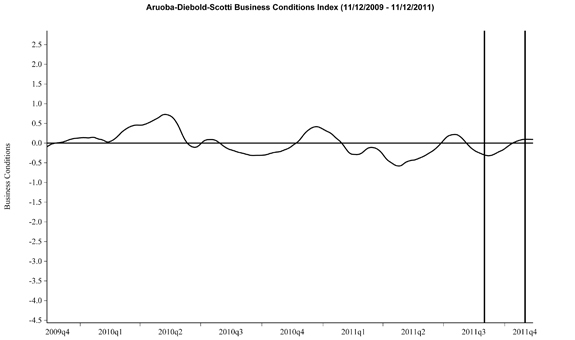 This entry was posted in Economic Forecasts and tagged economic forecasting on November 28, 2011 by Ted Kavadas. On an intermittent basis I have commented on ECRI’s methodologies and its indices, including the WLI Growth. I include the WLI Growth in the monthly update of economic indicators. Although ECRI’s WLI Growth measure receives far greater attention, it should also be noted that there is a ECRI WLI (Weekly Leading Index) from which the WLI Growth measure is derived. The WLI is a forward-looking composite leading index that anticipates cyclical turning points in U.S. economic activity by 2-3 quarters. Updates are available on Friday mornings to members at 9:00 AM and to the public at 10:30 AM. The monthly data starts in 1949, and the weekly data in 1967. This entry was posted in Economic Forecasts and tagged ECRI on November 23, 2011 by Ted Kavadas. The October update of the USA TODAY/IHS Global Insight Economic Outlook Index shows real GDP growth, at a six-month annualized growth rate, slowing to 1.1% by March. Persistent unemployment, elevated debt levels, high energy and food prices and low confidence have stalled consumer spending. Businesses are hesitant to expand amid uncertainty. As of 11/11/11 the WLI was at 122.1 and the WLI, Gr. was at -7.8%. As per the November 18 release, the LEI was at 117.4 and the CEI was at 103.5 in October. This entry was posted in Economic Forecasts and tagged ADS Index, Aruoba-Diebold-Scotti Business Conditions Index, Chicago Fed National Activity Index, Conference Board CEI, Conference Board LEI, Dow Jones Economic Sentiment Index, economic forecasting, economic indicators, ECRI, USA Today / IHS Global Insight Economic Outlook Index on November 22, 2011 by Ted Kavadas. The 52 economists surveyed in November—not all of whom answer every question—put 1-in-4 odds that the U.S. will experience a recession in the next 12 months, down from a 1-in-3 chance they were seeing just two months ago, when concerns were at their highest level since the recent recession ended in June 2009. The economists, on average, put 2-in-3 odds that the euro zone will fall into recession. I post various economic forecasts because I believe they should be carefully monitored. However, as those familiar with this blog are aware, I do not necessarily agree with many of the consensus estimates and much of the commentary in these forecast surveys. This entry was posted in Economic Forecasts and tagged Economic Forecasts on November 21, 2011 by Ted Kavadas. While dynamics similar to those discussed in the segment have been noted in previous posts on this blog, this segment is yet another notable reminder of the changing economic condition and the growing need for food assistance. This segment focuses on an area, Forsyth County, near Atlanta. But for more families here, prosperity is a pretense. The job’s lost, the savings are gone, and the big house is either in foreclosure or on its way. And just keeping food on the table is a struggle. So Forsyth’s newly-needy file into local food banks. Yesterday’s GIVERS have become today’s TAKERS. Nearly 15 percent of Americans are now receiving food stamps, a record level, and a jump of about two-thirds since 2007. One in SIX Americans – 49 million people – say they have trouble putting food on the table. At Forsyth County’s Lambert High, eight percent of kids now get free lunch, double the number three years ago. This entry was posted in Uncategorized and tagged food assistance, food bank on November 21, 2011 by Ted Kavadas. 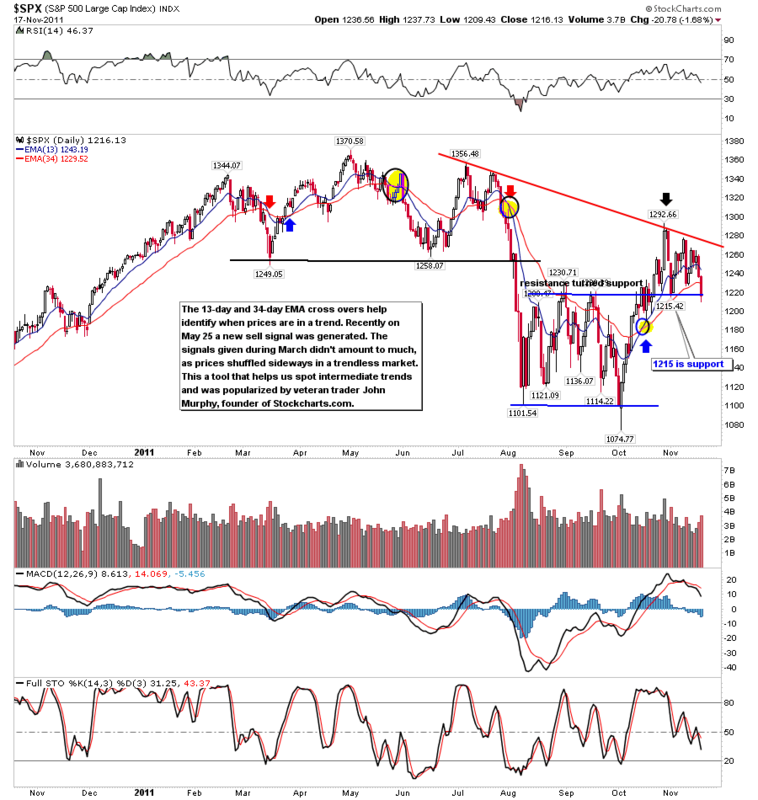 On October 17 I wrote a post titled “Danger Signs In The Stock Market, Financial System And Economy.” This post is a brief update to that post. My overall analysis continues to indicate that there is an elevated and growing level of danger. Many prominent parties seem to be fixated on the European financial problems, and seem to be overlooking other problem areas. While I believe that the European debt problems are very serious and have broader implications, (as explained in yesterday’s post “Europe And Contagion – Broader Implications“) the other problems are of great concern as well. Overall, my analysis indicates that this continues to be an environment of rising risks and therefore is dangerous in nature. As far as the stock market is concerned, the situation as described in the October 20 post (“Thoughts On The Next Stock Market Decline“) still applies. This entry was posted in Investor, Stock Market and tagged building financial danger, S&P500, Stock Market on November 18, 2011 by Ted Kavadas. Europe’s debt troubles on Tuesday spilled over to top-rated nations that had been largely untouched by the crisis—including Austria, the Netherlands, Finland and France—in an ominous sign for European policy makers. I continue to believe that “contagion” already exists. Also, the broader implication of the European situation – and one that is entirely lacking recognition – is whether the overall concept of sovereign debt is (in the process of) being repudiated. If so – and it appears too early to definitively answer – the implications are massive. European debt crisis: This situation appears to be unresolved in many respects. In fact, it almost appears to be a slow-spreading contagion. One interpretation of this overall situation is that it may signal a repudiation of (sovereign) debt. Should this interpretation prove accurate, it would not bode well for our highly-indebted global economy. This entry was posted in Investor on November 17, 2011 by Ted Kavadas. I found various notable items in Walmart’s Q3 conference call transcript (pdf) dated November 15, 2011. I view Walmart’s results and comments as particularly noteworthy given their retail prominence and focus on low prices. I have previously commented on their quarterly results; these previous posts are found under the “paycheck to paycheck” tag. that the economic strain is taking its toll. Economic conditions in the third quarter remained largely unchanged. Our core customer was still impacted by high unemployment and continued uncertainty over the economy, leading to declining consumer confidence. Although they remained higher than a year ago, gas prices, which positively affect customer trips, moderated during the quarter. Rising food costs continue to be a major concern for customers. We hear from some shoppers that they believe it will be more difficult than ever to afford holiday meals for their families. approximately 4 percent, in line with what’s been seen throughout the industry. But given our price investment, the impact to our customers was substantially less. overwhelmingly positive and layaway transaction volume continues to exceed plan. Our customers tell us that they appreciate that we’ve brought back this service, and it’s a great way to help families on a tight budget shop for Christmas. As a reminder, we’ve added service fees to reduce layaway cancellations in the fourth quarter. This entry was posted in Uncategorized and tagged paycheck to paycheck on November 16, 2011 by Ted Kavadas. The Philadelphia Fed Fourth Quarter 2011 Survey of Professional Forecasters was released on November 14. This survey is somewhat unique in various regards, such as it incorporates a longer time frame for various measures. As for “the chance of a contraction in real GDP in any of the next four quarters,” estimates range from 11.8-17.3% for each of the quarters through Q4 2012. As well, there are also a variety of time frames shown (present through the year 2020) with the expected inflation of each. Inflation is measured in Headline and Core CPI and Headline and Core PCE. Over all time frames expectations are shown to be in the 1.4-3.6% range. This entry was posted in Economic Forecasts and tagged Economic Forecasts on November 15, 2011 by Ted Kavadas.